Many system of classification of fungi have been proposed by various mycologists. Classification are based on the following features. · Morphology and appearance of the fungus. · Morphology of reproductive structures. · Types of spores and method by which they are produced. · Nature of the life cycle. · Besides, physiological and biochemical features of fungi help in the classification. I) According to the sepatation of the mycelium and on the basis of characteristic features of reproduction. Sexual Reproduction: Somatogamy, Basidiospores formed on sterigmata. d)Deuteromycetes (Fungi Imperfecti): In these fungi only asexual method of reproduction by means of conidia has been observed. Perfect or sexual stages are absent. Hence they are grouped under an artificial group called fungi imperfecti. 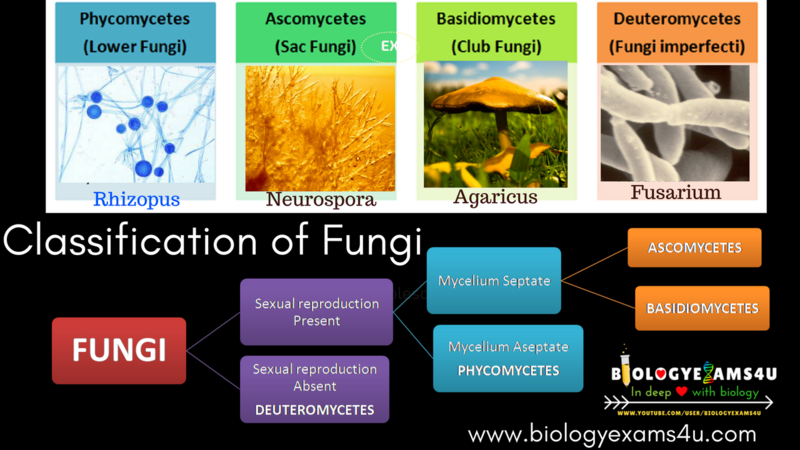 II) Classification of fungi is based largely on the particular life cycle involved. Mycelium: Branched, filamentous and coenocytic hyphae. Sexual reproduction: Take place by means of gametangial copulation. This note is very useful.... Thanks! !